Lane Keeping Aid uses a camera mounted at the top of the windscreen to monitor the road ahead of the vehicle. The images from the camera are continuously analysed to detect lane markings, typically solid or dashed white lines that delineate the edges of a lane or carriageway. Information about the position of the car relative to the lines is then used to help the driver stay within the intended lane. Lane Keeping Aid does this in two ways. As the car drifts towards the lane marking, a slight steering torque is automatically applied away from the line, towards the centre of the lane. This steering torque is very gentle and, in most circumstances, will not by itself keep the car in its lane. However, the steering is enough to be sensed by the driver and to act as an indication that corrective action should be taken. Secondly, when Lane Keeping Aid detects that the car has drifted over a line, the steering wheel vibrates as a warning to the driver. The two parts of the system can be separately turned on and off by the driver. The alert function provided by the vibrating steering wheel retains the last setting used by the driver – ‘off’ if the driver has previously switched it off. The steering torque is always off at the start of a journey and must be switched on by the driver if required. The system operates only at speeds above 65km/h and assists in highway driving, not in urban situations where lane crossings are frequently needed. Lane Keeping Aid does not function if the driver uses the direction indicators, signalling a deliberate lane change. The system works with one line or with two: it does not try to centre the car in the lane so it can detect when a single lane marking is being approached or crossed. The Lane Keeping Aid is a technology designed to assist the driver in avoiding accidents caused by unintended lane departure. These types of accidents are relatively frequent especially on highways and on rural roads. Their severity is reasonably high in terms of collision speed and the injuries sustained by the vehicle occupants can be severe or fatal. It is estimated that a system like Lane Keeping Aid could provide a useful benefit for around 4% of the severely and 9% of the fatally injured car occupants across Europe. However, it has to be noted that this estimations are dependent on some constraints; especially the system turn on status and the appropriate driver response to the given warning are essential in this respect. Neither of the functions of Lane Keeping Aid is automatically switched on at the start of a journey, meaning that action is needed by the driver if the safety benefit is to be realised. Effective functioning of the system requires an unobstructed view for the camera: mud, ice, leaves etc will compromise the efficiency of the system. To mitigate this, the windscreen is electrically heated and the camera is located within that part of the windscreen swept by the wipers. Lane Keeping Aid will not recognise all lane markings: unusual or indistinct markings will not be detected or are ignored and the system will not be able to assist the driver. In some cases, the system may incorrectly detect a lane crossing and warn the driver when it is not needed. 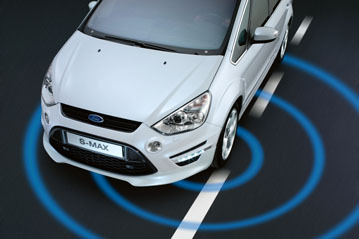 Following extensive development tests within the Ford group, Lane Keeping Aid was assessed by an independent test laboratory in Germany (BASt). The car was allowed to drift towards a lane marking at a variety of different drift rates and at different vehicle speeds. In each case, the function of the system was checked with help of differential GPS to see if the system recognised the lane marking; if it tried to steer the vehicle away from the line; and, if it was not able to prevent a lane crossing, whether or not it delivered a warning to the driver through the steering wheel. Road trials throughout Europe were determined to establish the proportion of typical driving scenarios in which the system could recognise real-life lane markings.